Parents can pay for the travel season using the button below! ​If your child is interested in playing soccer at a higher level, our club offers travel teams that play from May through July against teams from other towns in Erie and Niagara County. Our travel fields are at Clint Small Stadium, Ives Pond & East Niagara (depending on age group). Games are played weeknights (specific game nights depend on age group). Many of our travel teams also play indoors at Sportsplex in North Tonawanda, Epic Center in Lancaster and Sahlens in West Seneca during the winter. Travel soccer is more competitive than the house league, the teams compete with teams from other towns based on skill and standings are kept. The travel teams also practice at least once a week during the summer season and at one of our local schools during the winter months to help provide the best skill training possible. Our teams play in the Buffalo & Western New York Junior Soccer League. Teams above the U14 level are usually those players who play on the high school teams and have extensive soccer background. Effective August 1 2016, the grouping of players will change nationwide, with encouraged adoption of best practices in August of 2016. 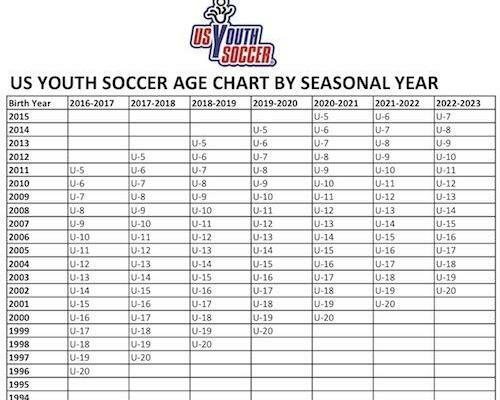 U.S. Soccer has mandated that all United States youth soccer programs go back to calendar birth years to align with international standards and Youth National Team programs. US Youth Soccer and New York State West Youth Soccer will implement the best practice of calendar year age grouping for player registration beginning with the 2016-2017 soccer year for US Youth Soccer programs and competitions. The new matrix came into effect beginning August 1, 2016.